Altus is pleased to present FLEXITABTM, an innovative and commercially validated technology platform providing novel, value added life-cycle management opportunities through Safer UseTM breakable, extended release (ER) tablets. 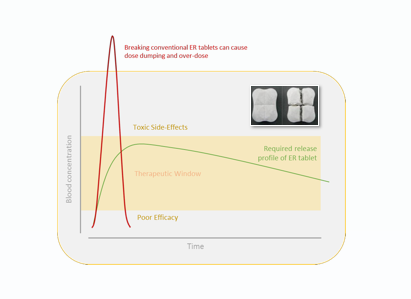 Conventional ER tablets may ‘dose dump’ their contents if broken or exposed to alcohol. This can lead to overdose and dangerous side effects. 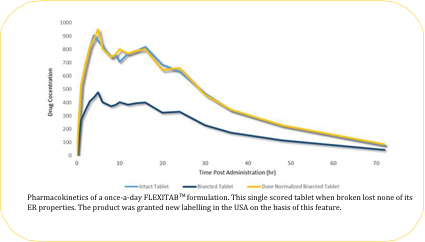 FLEXITABTM tablets maintain their drug release profile when broken and are alcohol insensitive – Safer Usefor the patient. A four way breakable FLEXITAB tablet design is shown inset. Safer Use: Whether developing the first ER tablet for your drug, or seeking continued protection for your existing ER product FLEXITAB ‘Safer UseTM tablets add value and protect from the harms of dose Reassurance for the physician, the carer and the patient. Partnering Model: Altus is seeking co-development partners with an interest in product-specific, territory exclusive licensing of FLEXITABTM technology based products. A list of potential product candidates is available on request. Altus: Formulation R&D inc. preparation of initial clinical supplies for 1st human bio studies, tech transfer support.